Chapel Theoskepasti («Covered by God») near the village of Pigi. North of Ikaria. In contrast with the other archipelagos, that of the north-eastern Aegean Sea has no specific name. It is the same distance from the Turkish coast as the Dodecanese, which anyway only got its name in 1908 when the islands united against the Ottoman occupation. To the south, it starts with the island of Ikaria, known almost uniquely to the Greeks, and which was a place of deportation for the communists after the Civil War of 1944-49. It is so mountainous that, for the construction of a little aerodrome, they could find only one strip of land, narrow and fairly short, at the entrance of Cape Drapanos, at the N.E. point of the island. When my plane approached, the wind was blowing at force 7 and the pilot had great trouble keeping his machine aligned with the strip. 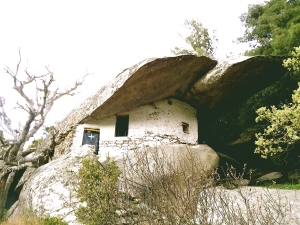 Anti-pirate house at Langada. West of Ikaria. I started by visiting the south-east coast, with a gale-force wind the whole day. Accessible, until recently, only by sea, I found the little port of Margaritis, half swamped by the waves, particularly seductive. The next day, I undertook to visit the western part of the island, marked only by stony tracks : I had heard talk of pirate-proof houses which I was determined to find. There was no more wind, but it was foggy. 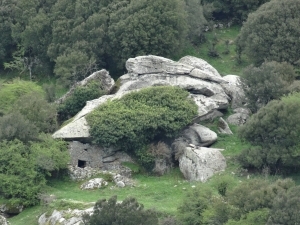 However these houses are spread around in the wild and even the locals thereabouts have trouble locating them. 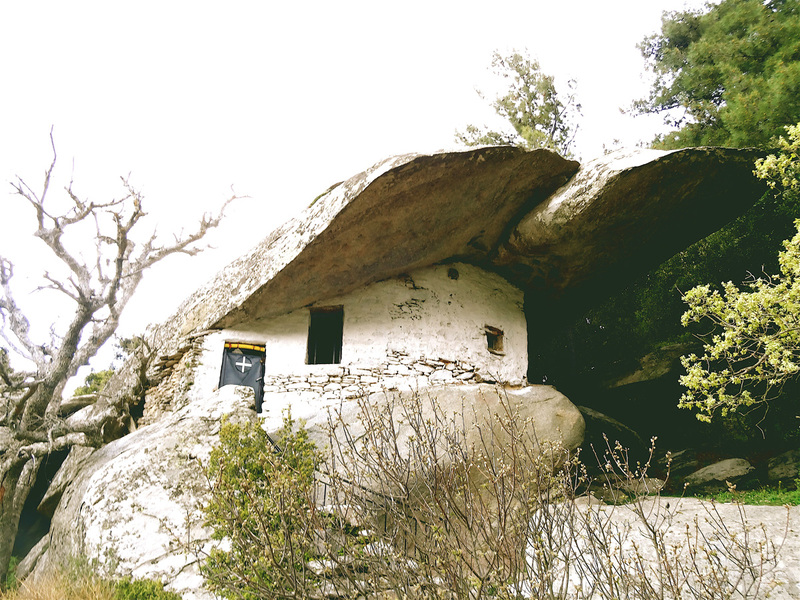 In my little guide it was written that would be able to find some at Langada, the oldest village on the island. Not a living soul ! After walking about randomly for a time, I eventually came across a goat-herd extracting ticks from one of his animals. And, what a miracle, just behind him an anti-pirate house presented itself. He opened it for me and showed me another which had served as a prison. The pirates, as long established as the sailor, have been a terrible scourge in the Mediterranean since ancient times, even after the great Pompey was instructed to lead an expedition to exterminate them. They prevailed particularly in the numerous Greek Isles which provided them with refuge. 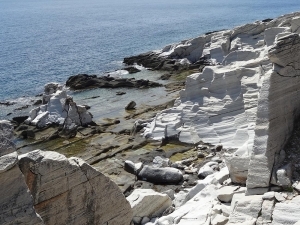 Ikaria has been their victim at several periods, the neighbouring islet of Phourni constituting an ideal raiding base. Therefore the inhabitants ceased to live on the coasts and took refuge in the mountains, where the geology protected them : one often finds big blocks of stone, more or less flat, forming a natural roof, which it sufficed to enclose by one or two walls. 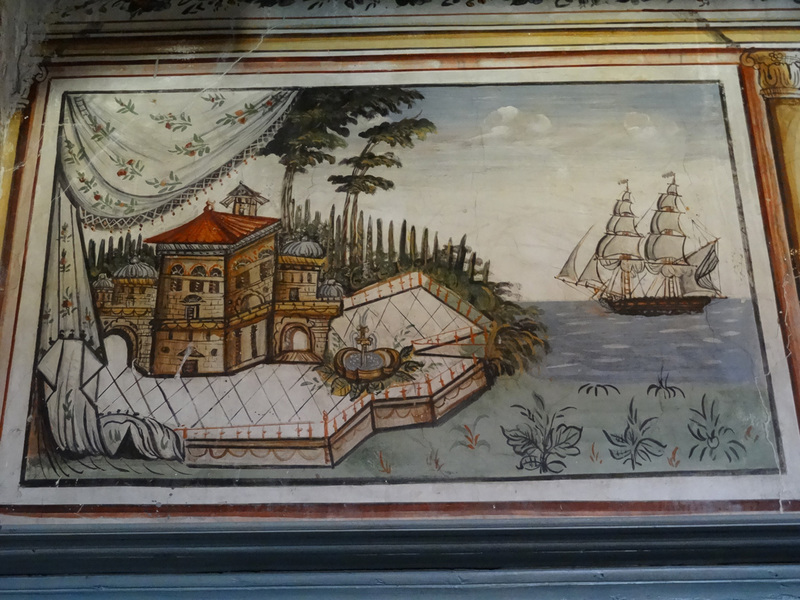 Only noticeable at close quarters, they allowed the Ikariotes to literally disappear during the 17th century, to the point that the island seemed uninhabited. When by chance the pirates arrived at one of these refuges, the inhabitants, warned by a system of lookouts, had disappeared. The brigands found at these poor people’s homes only some herds and worthless objects and nothing for their trouble! The history of this population, as frugal as they were cunning, illustrates a universal rule: the best defence against covetousness is to possess nothing. 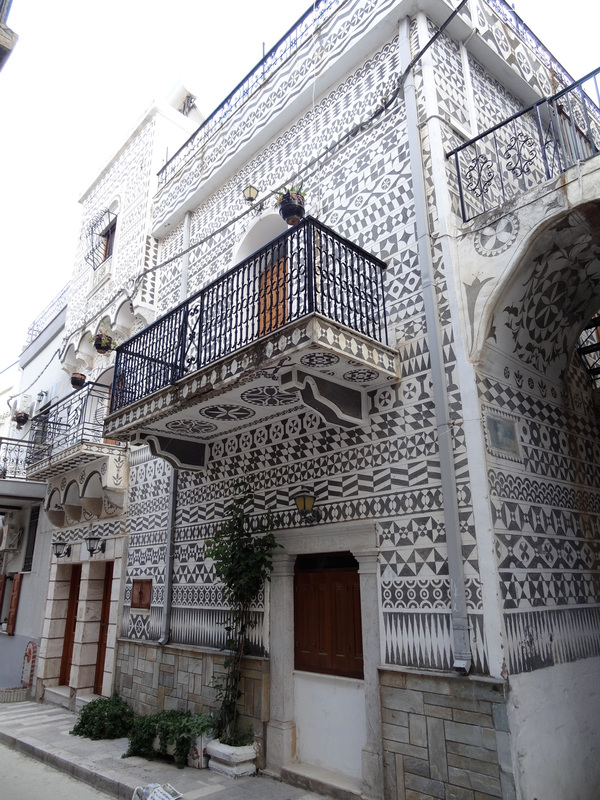 Genoese Arcade in stone at Thymiana, near the capital of Chios. 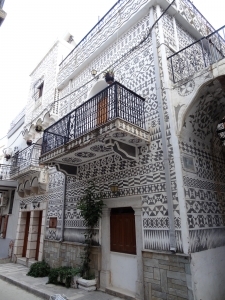 Façade «xysta» («scraped»), typical of the village of Pyrgos. Island of Chios. When I told Spiro, my Greek « cousin by alliance », that I was going to pass through Chios, he told me that his grandmother was born there and left the island, aged 16, to marry a Greek from Alexandria, much older than her. 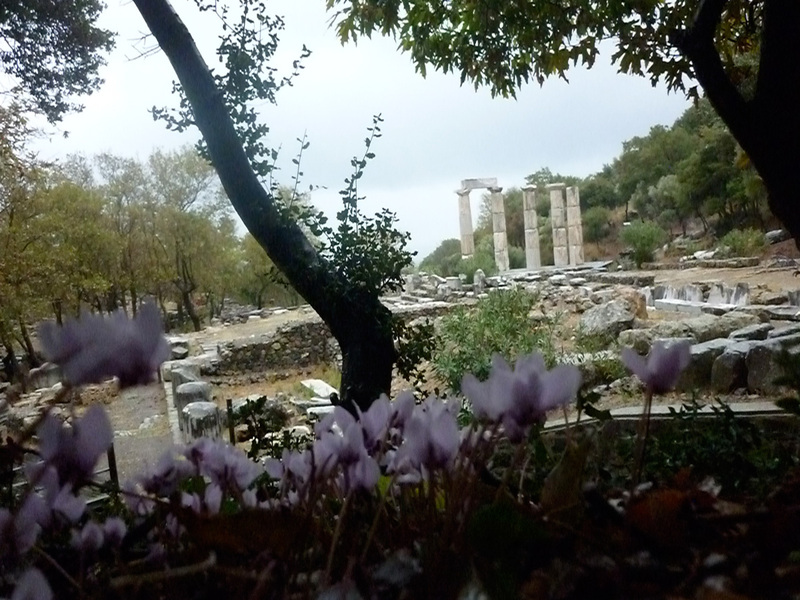 It was an arranged marriage, a custom which lasted in Greece until the middle of the 20th century. 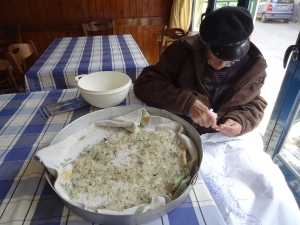 Today Chios is still a fairly wealthy island thanks to a local speciality: the growing of lentisque, a bush from which is extracted a resin, the «mastic» already popular during the Ottoman Empire, and which is used to make sweets and beauty products and for phytotherapy. I had nothing but the name of a distant cousin of Spiro and of his village, Thymiana : I made a very noticeable entrance into the « kafenio », frequented only by men in the areas away from tourism. Obviously I immediately found someone who knew the cousin in question and who volunteered to take me there. I was warmly welcomed by the daughter of Andreas ; my knowledge of Greek and my relationship, even by alliance, made me a full member of the family. This young woman taught French and English ; unmarried, she lived with her recently widowed father. He soon joined us and the conversation was about their family history. Then Andreas slipped away to smarten herself up and took me to a restaurant. Impossible to refuse, Greek hospitality insists. We were the only customers in the little inn. The grandfather was sorting the mastic at the next table while I was tasting some savoury surmullets. 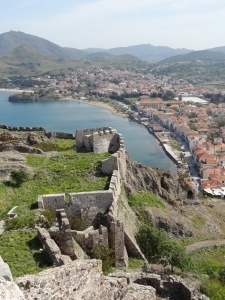 Andreas, a fisherman at retirement, supplemented his income with a bit of masonry. We talked about the crisis : in the islands, as in the country, it is less rough than in the big towns. Nearly everyone owns his house, and with a little boat, a small field, a chicken coop and some goats for the feta, one can get by. The Greeks jumped feet first into the consumer society, with their entry into the EU, in 1981. Thousands of them, squeezed and forced by unemployment or a fierce drop in their income, are now returning to their villages to reluctantly take up the path of decay. 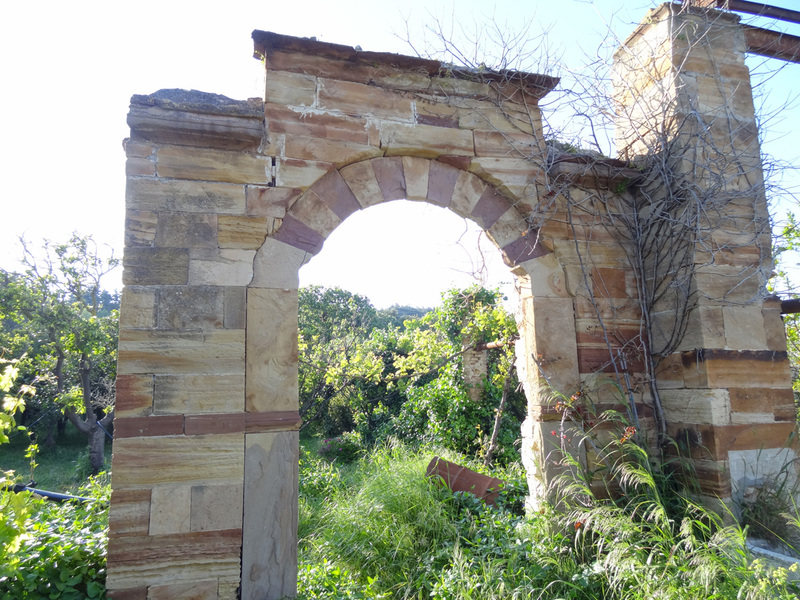 The naive Westerners who go to Lesbos to visit the house where Sappho was born will be disappointed: it doesn’t exist ! On the other hand, one can see a petrified forest, some tower houses, an exceptional 18th century mansion, and the magnificent mosaics of Menander’s house in the museum of Mytilene. Poney dustman for the narrow streets at Molyvos, Lesbos. 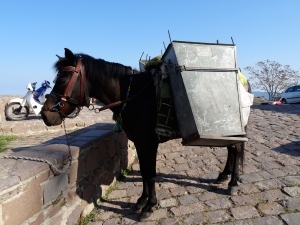 This local breed of poney is also used for «ambling races» at village fetes. 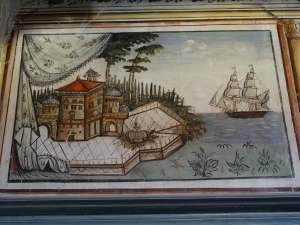 Wall painting on the town house Vareltzidaina, late 18th century. Village of Petra. Lesbos. 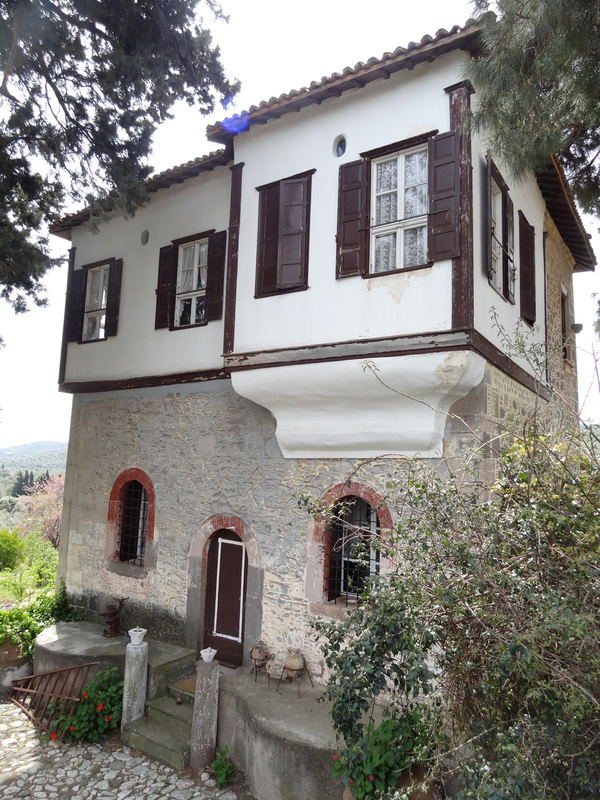 Typical house-tower of Lesbos at Thermi. 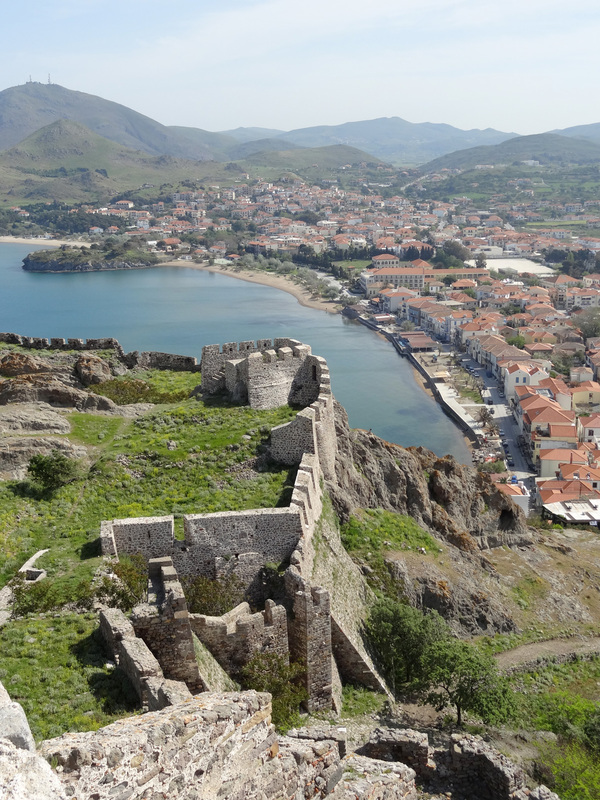 View of Myrinas, capital of the island of Lemnos, since the citadel built in the 12th century on ancient foundations by the Byzantine emperor Andronic Comnene, with Venetian, Genoan and Turkish additions. 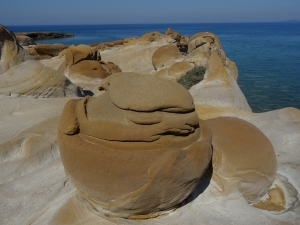 Volcanic rocks of Pharakla, Lemnos. 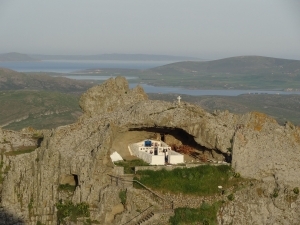 Chapel of the Virgin Kakaviotissa to the east of Myrinas. Kouros. 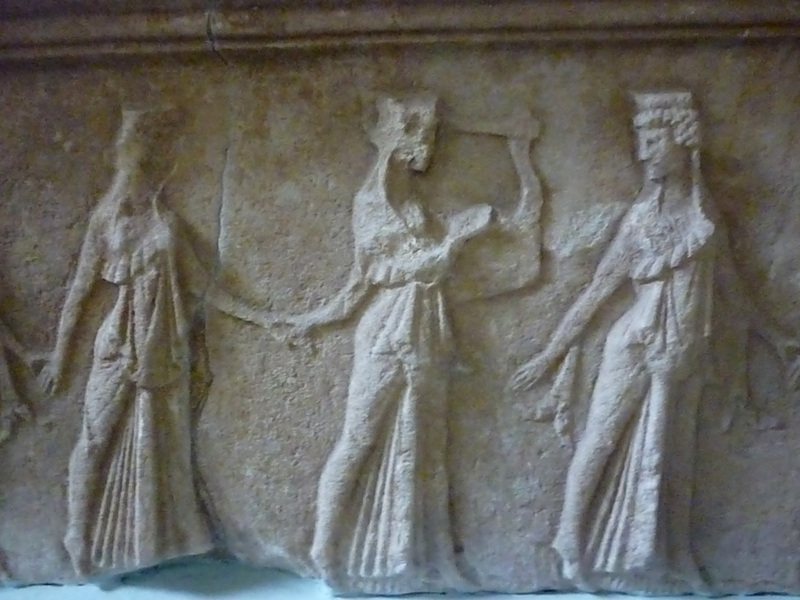 Museum of Liménas, capital of the island of Thasos. 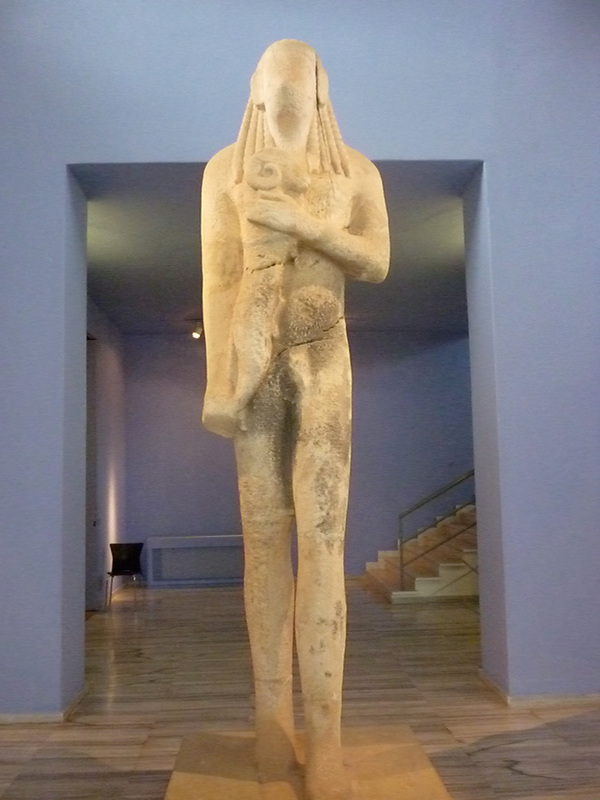 Statue from the «archaic period» ( 7th to 6th century BC ) influenced by Egypt : stiff posture, left foot forward, enigmatic smile. 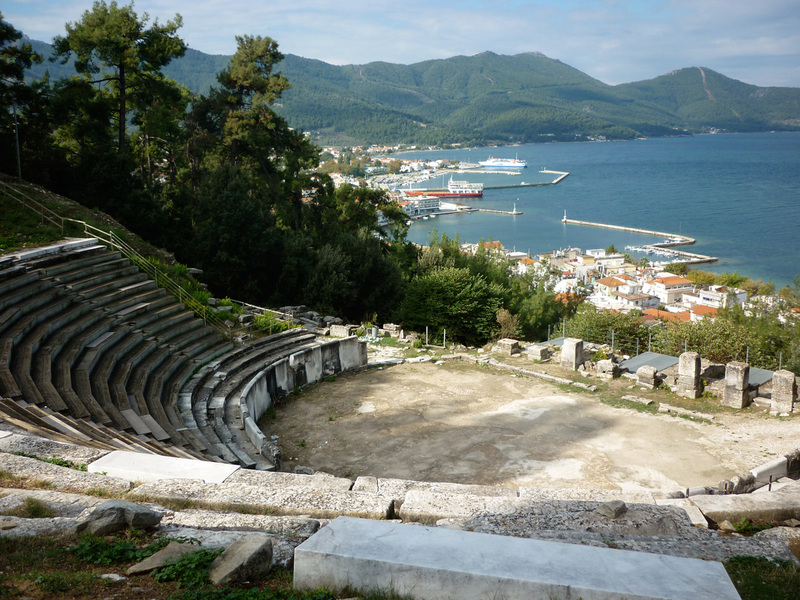 Antique theatre at Limenas. Island of Thasos. It was at the time when I did not systematically hire a car, but sometimes used public transport. 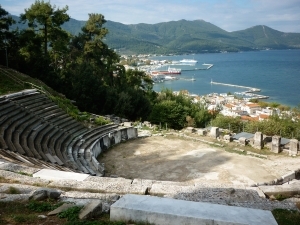 On the island of Thasos, having visited the archeological site of Limenas, the main town, with its pretty theatre overlooking the port, its ancient citadel and its museum, which houses a gigantic « kouros kriophore » ( carrying a ram ), I had taken the bus to do a tour of the island in a day. Halfway round, an old lady – she could have been my age, but country life ages one faster – came to sit beside me. Tourists being rare at this time of year, she asked me where I was from. There followed the inevitable series of questions about my situation, family-wise and professional. When I told her my former occupation, I read in her face the deference which I have ceased to see in those of my compatriots, for whom the criticism of teachers is a national sport. When I told her that I was divorced and childless, her look filled with compassion, because for a Greek lady this situation is a curse. She asked me if I had been beaten by my husband ( in Greek one says « made to eat wood » ! ), certainly the only valid motive in her eyes for getting a divorce. I replied in the negative because I could not give her the true reasons, certain subjects still being taboo, and even less tell her that I was happy in that state, the notion of individual freedom being incomprehensible in a society where the family is at the base of everything. She summarized her life for me : eldest daughter of a poor family, she had remained unmarried to bring up her brothers and sisters after the death of her mother. She got off at the village of Sotiras which she had never left. During my return, I absorbed myself in my reflexions about the injustice of fate, and how lucky I was to have been born into a family and a country where a woman can escape her destiny. 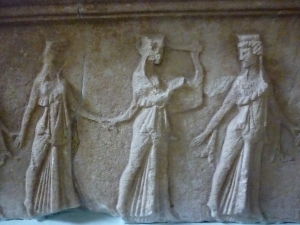 Dancers of the « mystery cult ». 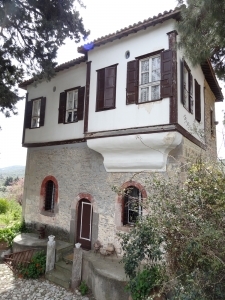 Museum of Palaiopoli at Samothrace.